If you live in Washington, DC, you’re familiar with an unpleasant summer phenomenon – the metro “hotcar”, when the air conditioning in a metro car is broken, creating a steamy, sweaty, messy commute. Kyle Conrad, an interactive designer, took this unpleasant situation and created a spoof website: Metro Hotcars: Dating Forward. 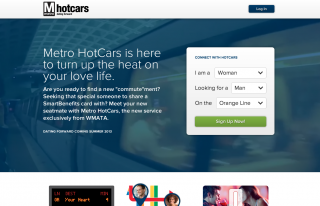 The site presents Hotcars as an opportunity to meet your mate while commuting.